YouGov CEO, Stephan Shakespeare, discusses British Airways. Today I’m returning to an issue that comes around like a baggage carousel every summer: the ongoing battle for the hearts and minds of British air travellers. I never tire of looking at this as it has so many angles – crisis recovery and the strength of a loved brand such as British Airways, the continued success of an exciting brand like Virgin Atlantic, alongside the inexorable rise of mould-breaking operators such as EasyJet and Ryanair. It is the British Airways tale that I want to focus on here. Almost exactly four years ago they were at their lowest ebb in the eyes of the public. Strikes, snow and the Icelandic ash cloud had seen their YouGov BrandIndex Index score, made up of six key image measures, drop as low as +1. 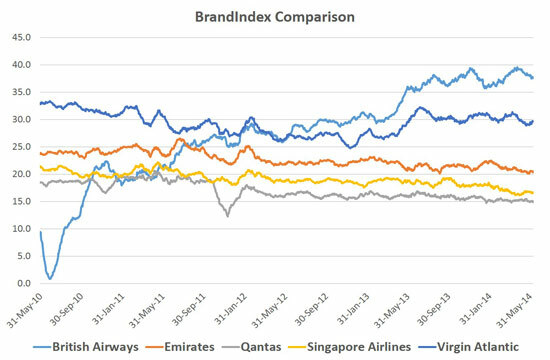 The accompanying chart shows the current top five airlines – but British Airways had fallen out of the top 20 in 2010. How different things look now. Their first six months of recovery were impressive enough, as BA quickly recovered to the low +20s. What is even more remarkable is the sustained climb since then. British Airways is now on +38, putting it in first place and eight points ahead of the nearest challenger, Virgin Atlantic. How has the company done this? BA has two clear advantages, and the job the company does in servicing its comparatively large number of consumers is a good one. Its satisfaction score amongst customers is +77, which is a good score, albeit not as high as the best because BA has a far greater number of customers than any of its long-haul competitors. The firm still ends up with more people in the overall population who are satisfied customers of BA than any other airline. Bolstering this strong performance is British Airways’ legacy of trust that has been built up since the brand’s foundation in 1974, making it a name that people believe in. This has been instrumental in getting people to move on from the problems. It is a lesson to any brand that positive public perception not only stands you in good stead on a day-to-day basis but builds foundations that allow you to survive crises when they hit.